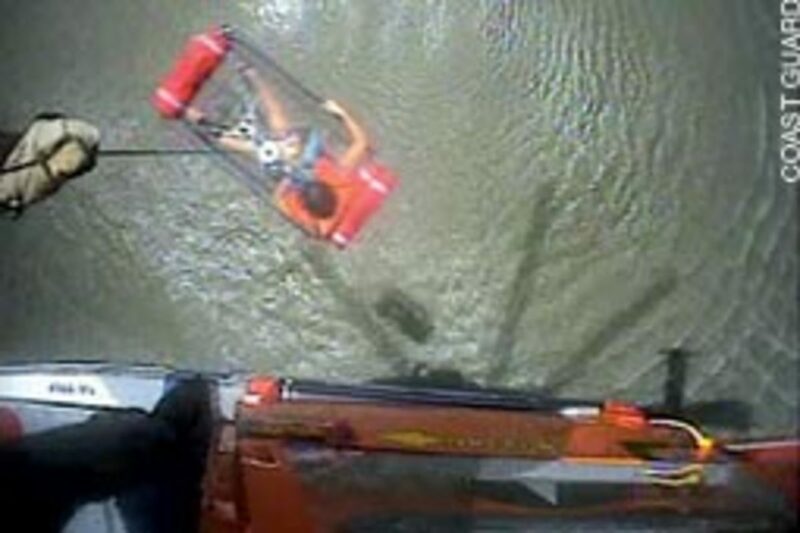 FIVE RESCUED - A Coast Guard Air Facility Charleston HH-65 Dolphin rescue helicopter crew hoists five boaters from a 25-foot sailboat. 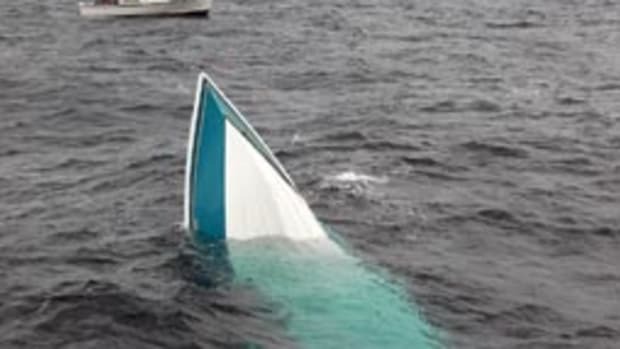 The boat was reported aground while attempting to sail near Deweese Island, S.C.
Station Oregon Inlet crewmembers located two men about six miles northwest of Manns Harbor on the shore of East Lake after their 16-foot jonboat capsized. Dare Central 911 called Sector North Carolina watchstanders and reported a 58-year-old man and a 72-year-old man were overdue. Their family reported the two men were expected back at 5 p.m.
One man was diabetic and the family was uncertain if he had eaten. 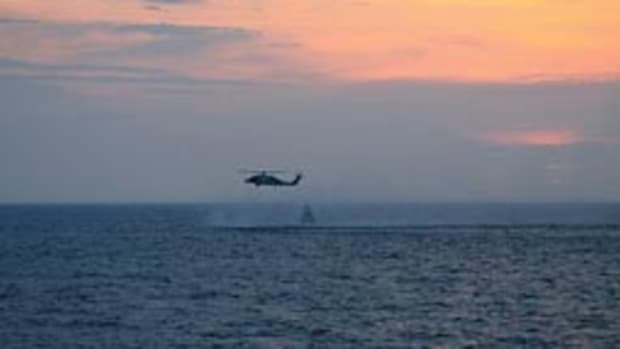 A Station Oregon Inlet crew responded with a 21-foot rescue boat and an Air Station Elizabeth City MH-60T Jayhawk helicopter crew was diverted from its nearby training. 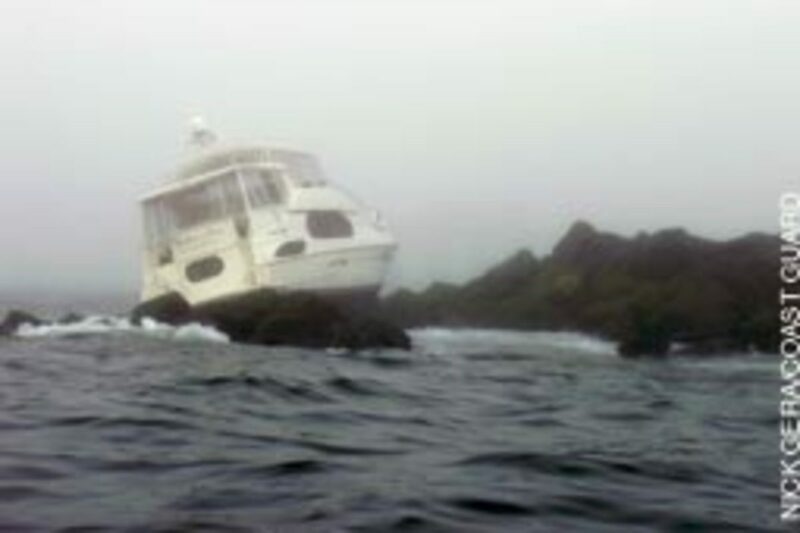 While the boat crew was searching, they noticed a flashing light near the shoreline. They investigated the flashing light and discovered the two men on shore. The boat crew transported them back to the boat ramp and awaiting family members. EMS transported them to the hospital to be checked. The diabetic man was cleared with no medical concerns. 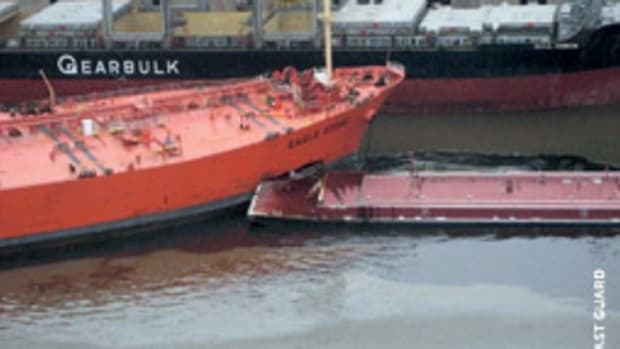 They reported that they were attempting to change fuel tanks at about 1 p.m. and the seas in the area caused the boat to capsize. The accident happened close enough to shore to pull the boat in and wait for a rescue. The Coast Guard medevaced a 50-year-old male from an 86-foot fishing boat after he sustained an ankle injury 35 miles east of Barnegat Light. The Coast Guard received a call at 4 a.m. from the captain of the Carolina Boy reporting that a man had slipped on the deck and broken his left ankle. The Coast Guard and Currituck Sheriff&apos;s Office ended the search for a missing man after his 18-foot vessel was discovered unmanned in Tulls Bay, N.C. 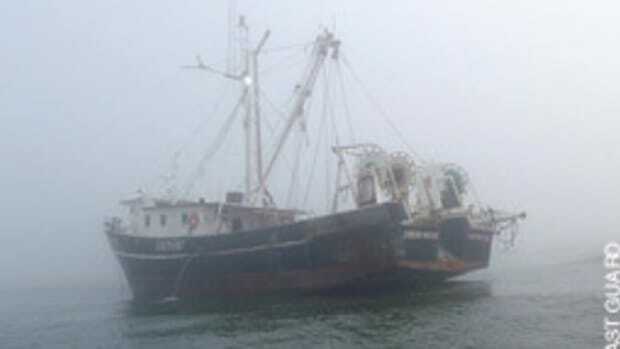 The Coast Guard searched approximately 19.5 square nautical miles. The man&apos;s body was found by North Carolina Marine Patrol within the search area around 10 a.m. The Coast Guard, along with a good Samaritan, rescued three people after the 20-foot boat they were aboard capsized 1 mile east of Shark River. The Coast Guard received a call at 12:28 p.m. from a crewmember of High Hope reporting they were taking on water. A good Samaritan from the boat Lady Gail Marie arrived on the scene after the boat capsized and pulled all three people from the water with no injuries. 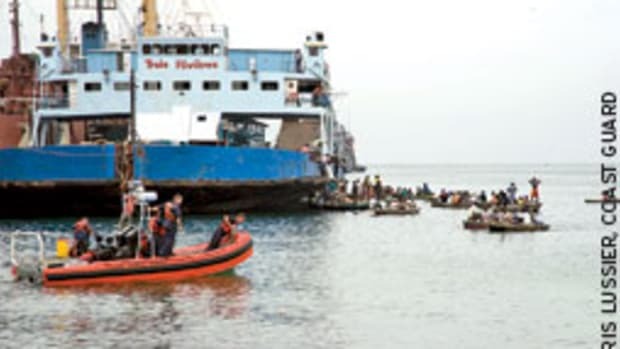 A rescue boat crew from Coast Guard Station Shark River arrived and transferred all three people to the rescue boat and transported them to the station where they were transferred to awaiting medical personnel. The Coast Guard rescued two people and their dog on Shark River after their 48-foot boat ran aground on the jetty. 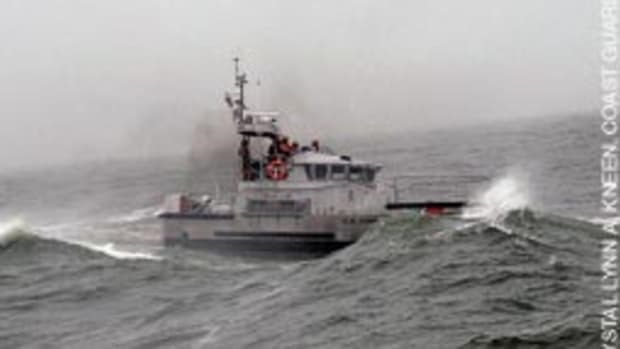 The Coast Guard received a call around 9:35 p.m. on VHF channel 16 from a crewmember aboard the Nadiein Ann reporting they were aground and taking on water. The Coast Guard called off its search for a 40-year-old man off the coast of Point Pleasant. The Coast Guard was notified by a member of the New York City Police Department reporting the man contacted a family member at 6 a.m. and was alive. 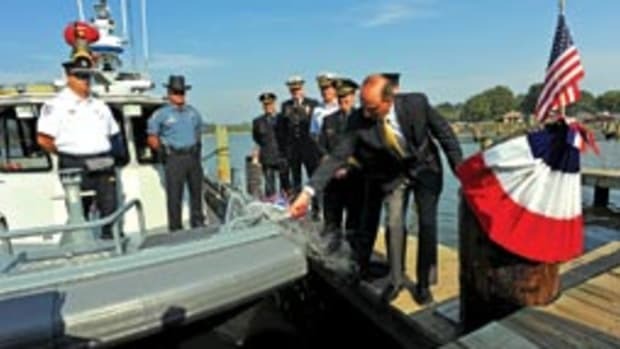 This article originally appeared in the Mid-Atlantic Home Waters section of the August 2010 issue.